One of my favorite films from the last couple years is, without a doubt, The Lego Movie. Besides being visually stunning and packed full of one-liners that might fly over the kids’ heads but give the grown-ups a chuckle, it provided a positive message: Confidence in yourself, combined with a solid foundation, can result in something truly special. For Emmet, the film’s hero, that foundation was comprised of the indispensable knowledge that came from the Instructions. These step-by-step, how-to pages not only got our orange safety-vested protagonist up and moving each morning, but eventually inspired him to take down the evil Lord Business with a carefully-crafted plan that helped he and his fellow Master Builders fly under the radar. Unfortunately, disc golf doesn’t come with a set of instructions. Sure, we can chase form videos on YouTube and pore over threads on various Internet forums, but when it comes to crafting the perfect combination of technique and equipment, trial and error is the rule, not the exception. As someone who reviews discs and, as a result, has a bag that is constantly in a state of flux, I understand the value in finding a mold or two that you can build your entire arsenal around. Whether it is a stable midrange to cycle through stages of wear, or an overstable utility mold that can save you from tricky situations, having a couple of tried and true foundational discs in the bag can go a long way toward improving your game. And an upcoming release from MVP Disc Sports is just that: a solid foundation upon which to build a bag. Currently available only at the company’s Circuit events but set for retail later this year, the MVP Relay is a stable-to-understable fairway driver that excels at holding release angles to create extended lines. It’s the first in MVP’s to-be-completed 16-mm rim-width class, putting it squarely in speed 6 territory. As the only unreleased mold for the brand’s inaugural three-disc promotional event, MVP has staked a large claim on the Relay having a wide range of appeal. Designed to be “beginner-friendly,” the brand’s marketing materials prior to the event touted the new disc as one that “balances distance and throwability” and is “built for precision drives.” Still, there will be non-beginners attending these events, so the disc’s use by everyone from noodle arms to cannons will be key. And for this noodle arm, at least, the Relay lives up to MVP’s claims. Fresh out of the box, the Relay just feels like it is going to be easy to throw. The smaller, less popular 16-mm rim fits in the hand comfortably and is buttressed by a smooth, flat wing. 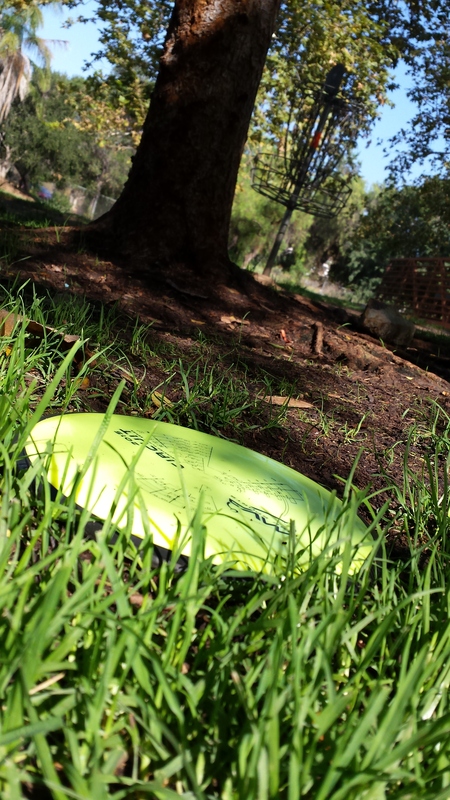 A flat top – a kind of calling card for most MVP drivers, at this point – further emphasizes the disc’s compact feel, lending confidence that one can get it up to speed even before giving it flight. Once I did let it spread its wings, though, I was a bit surprised. Thrown flat, it had more high speed stability than I anticipated, holding a long, straight flight before a minimal fade. It wasn’t really understable, but more just a linear, point-and-shoot type of line, almost like a broken in Innova Teebird. On a hyzer release, I was anticipating being able to flip it to flat, but it held the hyzer instead. On an anhyzer, it held pretty reliably for about 75 percent of its flight before flexing out at the end. These were all useful lines, to be sure. But I was a little concerned that this might not be as user-friendly as advertised. It turns out, though, that I just needed to knock some of the new off of it. Since I was given a review copy of this mold prior to hosting an MVP Circuit in San Diego, I had the advantage of seeing how the disc would wear in. And when the shine is off, and a few tree hits have taken their toll, the Relay becomes the controllably understable animal I had hoped for. It really started to show its true colors when I took it to Colina Park – a well-manicured disc golf course on a ball golf course and home to the Circuit I hosted – and gave it a run as the only driver in the bag. There aren’t a ton of holes there where the Relay is needed, but it certainly did its job when called upon. As a result, I will offer this caveat to anyone who checks out the Relay at a Circuit (or via the post-event market) and doesn’t necessarily see its potential: Let it breathe. Throw it around, add some wear, and watch it become more useful. Hole 8, for example, is a long, straight shot that has a relatively wide fairway. The difficulty, though, lies in the landing zone. With a bunker to the left and a golf green in front of the basket – both of which play as out of bounds – a premium is placed not only on being able to clear the obstacles, but land precisely. With a slight headwind, the Relay flipped up nicely from a hyzer an rode a straight line past the basket. It was an overthrow, but it was also safe. The ability to control both the lines and the landings with this disc, I think, come from that flat wing design. Crazy skips are not going to happen, nor is a tremendous lateral fade. In this fashion, the Relay is pretty beginner-friendly, as it can be forgiving even when not put all the way up to cruising speed. As I integrated it into the bag for my normal, non-Circuit rounds, the Relay wore in gracefully, with the high speed stability easing into a gradual turn and a respectable amount of glide being added to the mix. Even with the added turn, though, it still holds a line reliably, and the extra legs really help add to its versatility. For example, the Relay already excelled on Hole 7 at Kit Carson Park, which sports some low canopy but only about 265-feet of length. Fresh or worn, a low line could be held here without a massive fade, making for a manageable birdie look. With the added use, though, I was able to stare down Hole 14 at the same course, add a little height to the Relay, and get it out to 300-plus feet. That didn’t happen out of the box, but rather required a month or so of hopping in and out of my bag to be realized. The MVP Relay finds a home in birdie range. On the whole, the MVP Relay is most impressive for its accessibility and versatility. The more I threw it, the more it reminded me of another slightly understable fairway driver: the Discmania FD. That mold is one that I have built my bag around, as it has the ability to handle numerous lines; eats my off-axis-torque and turns it into straight shots; and is packed with easy distance. For those who throw MVP exclusively, or are searching for a fairway driver to be the foundation of a bag, the Relay, like the FD, fits the bill. But it isn’t just for noodle arms. Carlos Oropeza, a higher-powered player who participated in the San Diego Circuit, made some adjustments and was able to find success with the Relay. Oropeza also mentioned a classic mold that the Relay could stand up against. There are plenty of people who use the Leopard as the basis for a bag. The Relay, then, is up for the challenge. 2) LIKE MVP Disc Sports. 3) LIKE and COMMENT on the pinned post for this review at the Noodle Arm Disc Golf page. For your comment, tell me which mold or molds you have built your bag around. The contest will run until Wednesday, September 2 at 9 p.m. PDT, when a random winner will be chosen. Good luck!